Office Space - Allentown, Pennsylvania. 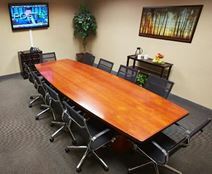 With a convenient location a short drive north of I78, this contemporary business centre offers fully furnished executive office suites on flexible terms. A complete range of amenities is available to help your business succeed. The regional transport links are also excellent and offer prospective tenants the opportunity to benefit from easy access to the wider reaches of the area with ease to make this center ideal for commuters and visitors.